Selected CVXE GIS project/applications focused on the American Community Survey (ACS -- http://proximityone.com/acs.htm) 2010 Equal Employment Opportunity (EEO) workforce special tabulation. Click toggle in Table of Contents at left to view different geography/applications. See details about ACS 2010 EEO/Workforce Special Tabulation -- http://proximityone.com/acs0610_eeo.htm. 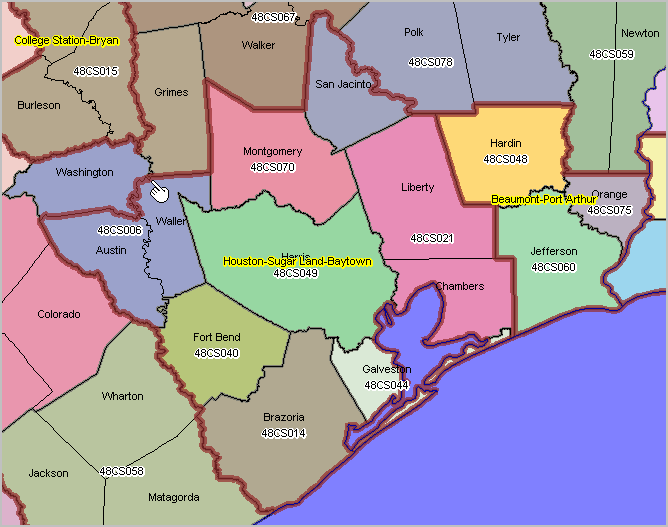 Houston, Texas area; metros shown with bold red-brown boundary. EEO/Workforce "County Sets" shown with black boundaries and CS labels. Pointer near Houston MSA boundary and within the 3-county countyset area (code CS48006) comprised of Austin, Waller and Washington counties. Countysets are de facto workforce data tabulation areas made up of county building blocks, covering the U.S. wall-to-wall, and comprised of one or more counties with a countyset total population of 50,000 or more. The approximate 1,400 countyset areas average 2+ counties per countyset area with many comprised of one county. 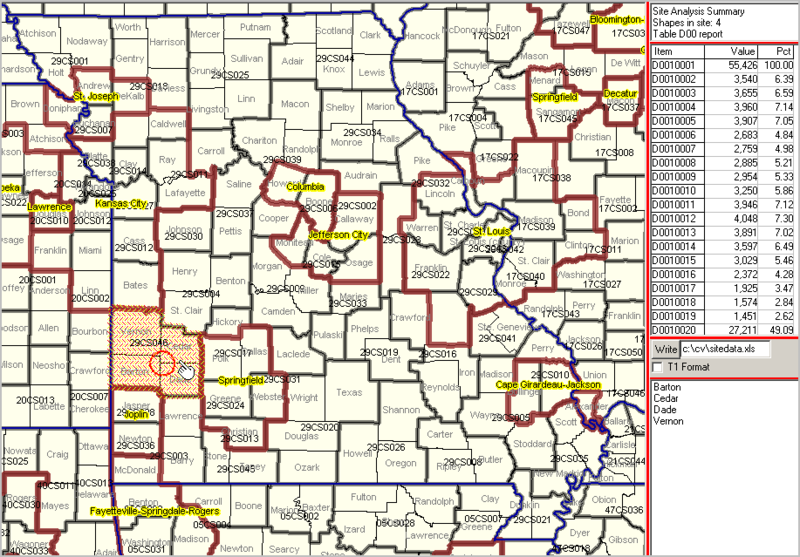 Missouri focus with metros shown with bold red-brown boundary. EEO/Workforce "County Sets" shown with gray boundaries and CS labels. CV XE GIS Site Analysis tool used to show demographic profile (right) for a 4-county region. Cross-hatched selection in lower left. "D" items in profile from Census 2010 Demographic Profile1 -- total population (d0010001) and population by 5-year age cohort.